Ruth Burgess was born in Sydney. She studied painting with Desiderius Orban in 1954, the same year she graduated from the University of Sydney with a degree in Arts/ Music. 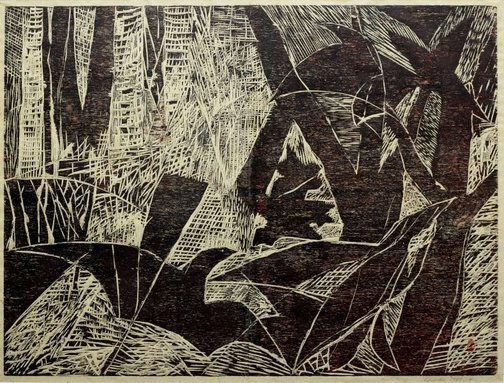 She was introduced to woodcuts in 1976, which she studied with Sue Buckley at the Workshop Arts Centre, Willoughby 1976-69 where she later taught from 1984-93. She has been profoundly influenced by China, especially its painting and calligraphy, as well as Buddhism. In 1988 she was invited with David Marsden to travel to Harbin in north east China, to the Northern Wilderness Woodcut Symposium and exhibition. They met local artists and spent time at the Central Art Academy, which caused a radical re-think of her own art practices. In following years she revisited China on several occasions to work and exhibit. 'Winter' was printed from Queensland rose maple plywood by the artist in her Sydney studio, and is one of four prints of the seasons. It represents the forest, a subject central to her work. Signed and dated l.r., pencil "Ruth Burgess ...1989". Author Unknown, Ruth Burgess woodcuts , 1995, 17 (colour illus. ).